By the year 1883, Fulham had grown very large, and thousands of poor people lived in the area. Schools for the children were few, and so in the January of 1883, the School Board for London bought some land at the corner of Halford Road and Emsworth Road (the old name for Farm Lane), to put up a school to take 1,000 boys and girls. The school we use today was designed by Mr J.Bialey, and he copied ideas from buildings in Holland. The outside bricks are red and blue hard Staffordshire bricks with decorations in white York stone. Before the building was finished a new piece was added to the east side nearest Farm Lane, and when many more children came to the school, an additional set of classrooms were put on the side nearest to North End Road. Panels on the walls show you when each piece of the building was added. The first Head Teacher was called Mr Wade. 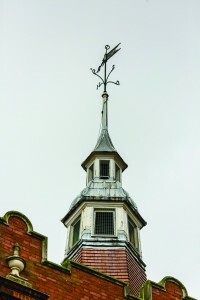 In the centre of main roof is a small spire, and this carries a weather vane. The spire was built as an air ventilation shaft to keep the school clear of fumes from fires and gas light smoke. The school bell used to hang in the cut out pieces of brick-work seen in the last chimney stack in the playground. It was put there as most of the pupils came from the roads to the east of the school, Tamworth, Ongar, Seagrave, Halford, and many other smaller roads which are no longer there. This was not only the place where the school keeper lived. There was also a cookery centre and a room for teaching the girls laundry and housework on the ground floor. Many girls from Halford School would find work as house-maids around the Fulham and Chelsea area when they left school. The Board was very proud of it’s schools, which were some of the best in the world and it proudly put it’s initials ‘SBL’ in red brick, on the walls carved in white stone, and made of iron in the school keeper’s railings. 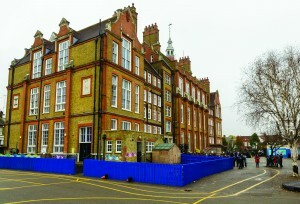 When the school was finished and opened in 1890, the total cost of the building was £14,745. This would be the equivalent of £13, 24704 today! The school has three floors, which were initially built to separate the infants, girls and boys because they were not allowed to be together in school. Different doors needed to be used to keep the children away from each other and names were put over them in capital letters. The stairways were built with brown and white hard, shiny bricks, so that they could be washed down. The school at first was only washed down every three weeks. Each classroom had a coal fire and gas lights hung from the rafters until electricity was put in, in 1949. The gas lights and the smoky fires made the rooms very stuffy, especially when classrooms often had 90 children in them. The children sat in long rows, and three steps went right across the rooms so that the teacher could see them better. This was positioned in the east wall of the top hall. Mr Wade sat here to collect the equivalent of 1p per week from each of the children. This was a lot of money to some of the poorer families. Children were given medals for having 100% attendance and punctuality – “never absent, never late,” and the ninth medal was always made of real silver. Few pupils had this, for they started work at the age of 13 years. Attendance fell in wet weather, and the infants were tempted back to school with a Punch and Judy show, or a tea party on Friday afternoons. At first, the school work was poor, but in four years it was some of the best in London. Most time was spent on reading, writing, and arithmetic. When it was too wet to use the playground, the children marched around the halls, or did drill with long poles. Infants who were not yet five were expected to sew clothes well enough to sell to the parents for other children to wear. Mr John Wade died in 1902 and he was so well liked that pupils and families put their money together and paid for the brass panel with his name on it which is still in the top hall today. In 1895, it was so cold that the Thames froze and many of the children who attended Halford School were too poor to be able to afford adequate food to keep them going. The poor children were fed soup and bread by Welfare Charity Workers. 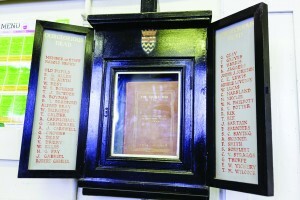 A memorial to pupils and staff who died in the First World War is in the Middle hall. 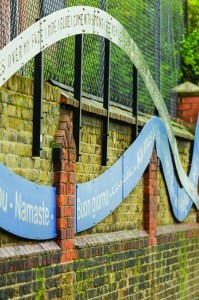 During this time many Belgian people came to live in Fulham and the children came to this school. Many children who attended Halford School were evacuated to the safer areas of the countryside during World War Two but some families chose to remain in the area and these children continued to attend school. Several former pupils have visited our school in recent times and have described how they often spent long days in the air raid shelter during the Second World War whilst bombs fell on Fulham. Lessons would continue in the air raid shelter which was positioned in the playground, close to the Nature Lab. At this time, all children had to carry gas masks with them in case of an airborne chemical attack. The school was damaged when many bombs fell in the local area at 4am on 26th June 1944. Most windows were shattered and the roof was destroyed. The infant hall (now the Bottom Hall) was turned into a makeshift hospital and many injured people were cared for here. 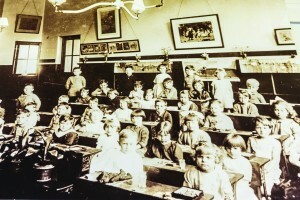 In 1931 the Elementary Schools were changed into schools for junior girls and boys up to the age of 11 years, and children older than this went to secondary schools. 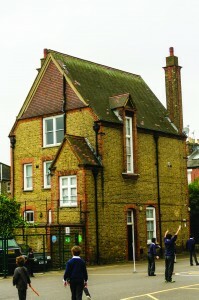 In the first junior schools at Halford, the children were divided up into houses with different names, and marks were given for good work, attendance, and behaviour. The best house was the one that had gained the most marks. There was a school uniform of red and blue and small badge to wear with the initials HPS – Halford Primary School. 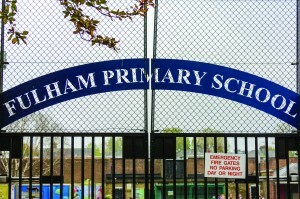 Halford School amalgamated with Harwood School in 1989 and was renamed Fulham Primary School. All through it’s one hundred years, Halford School has had many children whose parents were not living in local houses, but in caravans. Before 1925, the school records note down that some parents were acrobats, jugglers, showmen, gold smelters, and a ‘sprinkler’. This man used to walk round the streets with a very large tub of water and ‘sprinkle’ the streets to lay the dust.